When Jemmie and her family move into the house next door, Cass's father quickly erects a fence to keep the families separate. But the two girls do not share their parents' prejudices, and soon they form a secret bond, based on their shared love of running, and an unexpected appreciation of Jane Eyre. This wise and touching novel has become a classroom favorite. Listen to it on my free time and enjoyed it. I would share this to a friend. 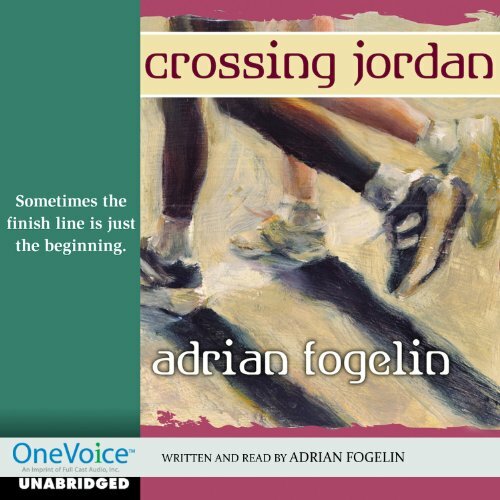 Crossing Jordan by Adrian Fogelin has some very good characteristics. The friendship between the two middle-school girls evolves nicely, and the background figures of an male friend of Cassie's, the dead neighbor (who is a significant presence), and the Jemmie's grandmother, are nice touches. However, the book lacks a stronger focus, eluding the difficult situation of mutual familial prejudice it builds up. Running is used in the beginning to create the friendship, but it falls off as the focus of the girls' interest in favor of reading Jane Eyre. Summarizing and quoting from Jane Eyre fills the later chapters of the book. While the book was a thread from the beginning, it overwhelms the book by the end, not to mention spoiling all the best parts for readers you were probably going to encounter it later in their education. That is no favor to either Jane Eyre or to the narrative Fogelin lets it usurp -- her own. So many little bits are not tightly bound with the rest of the book. Why the beehive hair style and consequent buzz cut for Cassie? It moves the plot and the characters no where. The story seems to have too many balls in the air, from prejudice to civil rights history to Jane Eyre to sibling conflict. Tightening in would have served the novel better, but the feeling is that with so much in the air, so much she wanted to discuss, she loses track of these points and lets all the pretty, spinning balls fall to the ground. Not a bad book, but not as good as it ought to have been.